It is that time of the year again â€“ the season of goodwill and bonhomie when all is supposed to be well with the world. And true to spirit, it was on this day in the year 1924 a Mohd. Rafi is born. An introduction to Rafi sahab or his music would be considered heresy; for his is a voice that needs no introduction, universally loved, admired and revered as he is. If Music as they say has a soul, then that soul couldnâ€™t have found a more befitting way to show its truer element than it does in the voice of Rafi sahab. It wasnâ€™t that Rafi sahab sang the songs that came his way so perfect that no one, but no one could have rendered then better â€“ that achievement in excellence might be his very own, but the way he unconsciously ( consciously ? ) draws out the best in us ( the listeners ) â€“ what of that ? For inherent in his voice is that calming force that would check the very Devil on his wake. His was a persona that would show a person in the glass for what they are â€“ and reform them too. His goodness reflected in his voice, he might even be called a faith healer of a sort â€“ for he always has and always will exert a positive influence on those who are in need of his healing touch. Time winds to a stop when he sings. Peace reigns, troubles forgotten â€“ you wish the moment would last forever. An expressive face is considered to be an asset for every aspiring actor. An expressive voice might be judged on the same plane, only that not everyone, aspiring singer or otherwise are lucky enough to possess this winsome quality. And one facet that adds to the rare beauty of Rafi sahabâ€™s voice is in its infinite expressiveness. Only wild Nature can ever hope to match the sheer intensity of power and passion that are held captive in his vocals. A voice thatâ€™s ever pleasing, ever inspiring, ever entrancing â€“ thatâ€™s our Rafi sahab. Talent and goodness rarely go together, and when they do â€“ you are awed by it. Dwarfed in its very presence. That is our Rafi sahab – he never had any flaws that he could call his own; his worth needing no validation whatsoever. This isnâ€™t yet another of those familiar sycophantic fan tributes – not to me, it isnâ€™t. Ho can a bâ€™day celebration be complete without the customary gifts? And knowing what would please you Rafi sahab, weâ€™ve brought you the only gifts that cannot possibly be bought from any â€˜storeâ€™ in the world. The gift of love, admiration, of veneration. The Universe Created thrice over wouldnâ€™t be enough to hold them all. For what youâ€™ve given us is more than weâ€™ll ever fathom or even deserve. I would only be echoing what everyone knows and wish to say, is the Truth that Life would be a dreary, miserable place were it not lit up by the beauty of your songs. Your voice Rafi sahab, is the only sanctuary that ever really comforted us often â€“ in grief, in disappointment, in ill health and in pain. Many a pill has failed when just the gentle strains of a dearly loved song given voice by you have been known to work miracles. Miracle â€“ thatâ€™s what your voice is. And you. There are very few singersâ€™ in this world who could hold sway over peopleâ€™s hearts and souls, defying Time and Age â€“ and you easily belong there. Your immortality was ensured in every song you gave life to. Father Time rules its tyrannical hand over everything, but even he had to retreat disappointed before you. And why not? Life smiles and weeps through your voice. It couldnâ€™t have chosen a better medium to express itself. In an ugly, crazed world, yours is the voice of sanity that unifies where no unity seems possible. Is that too just the charm at work or is it something more ? The Unseen Power at Work ? Thereâ€™s supposed to be an affinity between seasons and personality. If thatâ€™s true then why doesnâ€™t it work for you? The icy, chill of bleak December with your sunny, ever smiling persona. Affinity? I donâ€™t see any. The genial, gentle singer with the most genuine smile the world has ever seen. A singer and a gentleman â€“ thatâ€™s the way we choose to remember you, Rafi sahab. Never thought that God could be so selfish wanting to keep you all to Himself. Well, He got the math all wrong â€“ for once. Each day brings with it only an excuse to love you more â€“ as if thatâ€™s even possible. We never would have known what true joy, peace, serenity, bliss is werenâ€™t for the many beautiful songs that you gifted us with. Your life, your music, everything about you is an inspiration to us. Then, now and ever. We love you and your soul-captivating voice. Truth be told, I canâ€™t quite decide what I am more enamoured with â€“ the voice or the person ? Happily, I am not alone in this dilemma. Most folks ( the rest hate to celebrate theirs at all ! ) get to celebrate their birthdays just once a year â€“ and we celebrate yours every day, whenever we hear a song of yours. And yet, hereâ€™s the interesting twist to the â€˜riddleâ€™ â€“ you remain ever young in our minds and hearts. Thatâ€™s how it should be â€“ will always be. You might have parted from us, but we certainly are in no mind to part with you â€“ not quite. Not ever. Eternal peace be with you Rafi sahab. Ameen. A Voice â€“ The Voice of Mohammed Rafi â€“ Our Rafi sahab. On this joyous occassion, we’ve brought in couple of happy video songs picturized on various stars of yesteryears. Click on the page links shown below to see streaming YouTube videos or download (115 MB) the complete birthday presentation movie file and play it from your PC. This entry was posted on Sunday, December 24th, 2006 at 11:56 am	and is filed under Meri Awaaz Suno. You can follow any responses to this entry through the RSS 2.0 feed. You can leave a response, or trackback from your own site. sorry to reflect about bad comments put up n kishore. many people in Andhra (telugu speaking) love kishore and there is a group of kishore fans. same thng is true in kanna da . I AM THANKING FROM THE CORE OF MY HEART TO ALL THE PERSONS INVOLVED IN MAKING AND PRESENTING THIS UNIQUE AND FANTASTIC RAFI SAHAB’S BIRTHDAY PRESENTATION VIDEO MOVIE . KEEP IT UP -MOHDRAFI.COM ! Mohammed Rafi was the greatest ever playback singer of India. Mohammed Rafi was the creator and architect of the Golden Era of music and melodies in India. He was uniquely and singularly responsible for the very existence of the finest artistic grandeur, splendor and original creativity that embodied the Golden Era of music and melodies of Hindi Cinema. Mohammed Rafi still reigns as the most favorite singer of all times with music lovers in India and other parts of the world. His voice was the most exquisitely pleasant voice with a divine grace and splendor. He continues to reign with the adoration of millions of music lovers and is a supreme inspiration to innumerable new playback singers. Mohammed Rafi was the true embodiment of the Golden Era of music and melodies of Hindi Cinema and he epitomized its finest artistic grandeur, splendor and original creativity that was at its very unique zenith. Mohammed Rafi had such fascinatingly wide musical range, supreme artistic caliber, versatility and mastery over music and melodies. Such was his voice clarity, pleasantness of pitch and exquisite tone that he was unsurpassable and unparalleled. Such were his invincible capabilities as a singer that his contemporaries accepted that he was a musical genius. They adored, admired and respected him for his supreme artistic caliber, original creativity and unparalleled musical skills. Mohammed Rafi has sung every kind of melody and song with such great finesse that it is impossible to decide which melody or song was better and which was best. He has sung all kinds of melodies ranging from traditional classical melodies to patriotic songs, from traditional ‘Ghazals’ to most heart rending sad melodies, from exquisitely pleasant romantic melodies to traditional ‘qauwaalees’, from the finest sung ‘ghazals’ to divinely soulful ‘bhajans’, from sad melodies of poignant despair to modern songs that were fast and fun-filled. Such was the greatness of Mohammed Rafi that every music composer depended singularly on him and his supreme caliber. Mohammed Rafi created a unique musical artistic identity and niche for each music composer whose compositions, he sang. Therefore, the following stalwart music composers: Naushad, Shanker-jaikishen (Duo), S.D.Burman, C.Ramchandra, Husnlal-Bhagatram(Duo), Roshan, Madan Mohan, O.P.Nayyar, Chitragupta, N.Dutta, Hansraj Behl, Hemant Kumar, Khayyam, S. N. Tripathi, Vasant desai, Salil Chowdhary, Ravi, Laxmikant-Pyarelal, Kalyanji Anandji, R.D.Burman and other music composers have all entirely depended on the supreme caliber and artistic creativity of Mohammed Rafi, who was a musical genius. Mohammed Rafi had imparted to each of these composers, a unique style and range in their musical compositions which lead to the development of their unique individual artistic creativity. Thus, the contribution of Mohammed Rafi to the music of Hindi Cinema has been supremely absolute and without him Hindi Cinema will be bereft of the finest artistic grandeur that epitomized the Golden Era of music and melodies. Mohammed Rafi’s voice conveyed every intricate human emotion with such subtle care, artistic dexterity, exquisite pleasantness and unique artistic creativity that it influenced and over-powered the hearts and souls of millions of music lovers all over the world. Mohammed Rafi had infused life into the poetry written by legendry poets (Shakeel Badayuni, Sahir Ludhianvi, Majrooh Sultanpuri, Hasrath Jaipuri, Shailendra, Rajendra Krishan, Kaifi Azmi, etc.) with the power of his supreme capabilities as a musical genius and marvelous singer. There was not a single actor in Bollywood who had not been given playback by Rafi sahab. Such was Rafi sahab’s greatness that for each and every actor for which he had given playback, Rafi sahab had ensured that his voice matched the tone of the actor for which he was giving playback and the world has seen how exquisitely his voice had matched the actors for which Rafi sahab had given playback. He had sung for the three most celebrate heroes of the Golden Era of the fifties: Dilip Kumar, Raj Kapoor and Dev Anand. He also sang for Guru Dutt, Bharat Bhushan, comedian Johnny Walker. He had sung for the next set of popular heroes of the sixties: Rajendra Kumar, Shammi Kapoor, Dharmendra, Shashi Kapoor and Jeetendra and many more. His voice personified the rebellious image of Shammi Kapoor and also gave expression to emerging, younger heroes like Biswajit and Joy Mukherjee. Shammi Kapoor himself credited a large part of his success to Rafi. Shammi’s image of the young, rebellious, carefree man can be attributed to the famous song: â€œChahe koi mujhe junglee kaheâ€ sung by Rafi and composed by Shankar Jaikishan. Rafi sahab had given playback to actor Raj Kapoor in a few films like: Barsaat(1949), Andaz(1949), Dastan(1950), Paapi(1950) and few other movies. Rafi sahab has also sung for singer-actor Kishore Kumar in a few movies like Raagini, Baaghi Shehzaada, and Shararat. Rafi sahab had sung for the next set of super stars of the eighties: Rajesh Khanna, Amitabh Bachchan and Rishi Kapoor. The King of Melody, Mohammed Rafi sahab has sung the maximum number of duets with the melody queen of India, Lata Mangeshkar. He also sang well known duets with Geeta Dutt and Asha Bhosle. Mohammed Rafi was born on 25th December 1925. He was born at Kotla Sultan Singh, a town near Amritsar in Punjab, to an orthodox, conservative Muslim noble family. His family had shifted from Lahore to Amritsar, during his early childhood. His elder brother Mohd. Hameed was aware of Mohammed Rafi’s love for music and encouraged it. Mohammed Rafi started taking music lessons from Ustad Abdul Wahid Khan and he also learned Indian classical music from Ghulam Ali Khan. One day Rafi and his brother Hameed went to attend a performance by K. L. Saigal. But the legendary singer refused to sing because there was a power failure at the venue. Hamed went up to the organizer to ask whether his brother could sing to keep the audience quiet. That was Rafi’s first public performance, at the age of 13. Among the audience sat noted composer Shyam Sunder, who invited Rafi to Bombay. Rafi’s first song was in Punjabi for the film: Gul Baloch – it was a duet with the singer Zeenat Begum. The song was “Soniye nee, Heeriye nee”, composed by Shyam Sunder. Shyam Sunder was impressed with his voice and gave Rafi seven songs in another film: Bazaar. In 1944, Rafi decided to move to Bombay, where Naushad gave him a break in the film: Pehle Aap (1944). Rafi sahab’s joy was immense, when Naushad sahab gave him a chance to sing in a chorus for a song that was sung by the Legendry K.L.Saigal. The song was: “Mere sapnon ki rani” from the film “Shahjahan (1946)”. Rafi made his mark with â€œTera Khilona Toota Balakâ€ in the film: Anmol Ghadi (1946). Rafi sahab’s song: â€œYahan Badla Wafa Kaâ€ from the film: Jugnu (1947) was instrumental in the creation of a new superstar of the fifties, the one and only Dilip Kumar, who became a legend in his later years. The film also had songs by Noor Jehan, composed by Feroz Nizami. After listening to his voice, the producer of Amar Raj, J B Wadia, insisted that only Rafi sahab must sing songs for his films. In 1948, on the fateful day when the father of the Indian nation, Mahatma Gandhi was no more, famous poet: Rajendra Krishan wrote: â€œBapu ki Amar kahaniâ€. It was sung by Mohammed Rafi on the very same day on All India Radio. It was so mesmerizing to hear the poetic-biography of Mahatma Gandhi, in the melodious voice of Mohammed Rafi that the millions of the listeners of All India Radio were all moved to tears with sorrow and poignancy. It was a great achievement because before that no singer had ever attempted to sing songs which had more than 2 stanzas but to sing a whole poetic-biography seemed impossible at that time however for Mohammed Rafi it was natural and many a time he has sung the most difficult and long compositions with absolute panache and marvelous elegance. Mohammed Rafi’s first song for late Naushad was “Hindustan ke hum hain” (We belong to Hindustan) for the film: Pehle Aap in 1944. The legendry melodies sung by Mohd Rafi sahab for the film: Baiju Bawra(1952) became instrumental in the creation of the Golden Era of Music in India. So, Rafi sahab was the sole architect and creator of the golden era of music and melodies in India, with his supreme caliber and invincible mastery over music. The finest ever melodies of Hindi cinema were created by the combined efforts of legendry playback singer: Mohammed Rafi, legendry music composer: Naushad and legendry poet: Shakeel Badayuni, in the following films: Mela(1948), Chandini Raat(1949), Dulari(1949), Dillagi(1949), Dastan(1950), Deedar(1951), Jadoo(1951), Diwana(1952), Baiju Bawara(1952), Aan(1952), Amar(1954), Shabab(1954), Udan Khatola(1955), Mother India(1957), Sohini Mahiwal(1958), Koh-i-noor(1960), Mughal-E-Azam(1960), Gunga Jamuna(1961), Son of India(1962), Mere Mehboob(1963), Leader(1964), Dil diya dard liya(1966), Ram aur Shyam(1967), Palki(1967), Aadmi(1968) and Sunghursh(1968). These above movies in which Mohammed Rafi, Naushad and Shakeel Badayuni have worked together, are the very embodiment of the Golden Era of music and melodies in Hindia Cinema of India. The following are the movies for which other lyric writers have written songs that have been composed by Naushad and have been sung by Mohammed Rafi: Pehle Aap (1944), Shahjahan (1946), Anmol Ghadi (1946), Andaz (1949), Babul (1950), Baradari (1955), Pyar Ki Daastan (1961), Saaz Aur Awaaz (1966), Ganwaar (1970), Tangewala (1972), My Friend(1974), Love and God(1986). Naushad sahab continued to work with Mohammed Rafi sahab till Rafi sahab’s last days. The last film for which Mohammed Rafi sahab had sung for Naushad’s compositions was for the film by the name: “Love and God” that was realeased seven years after the passing away of Rafi sahab in 1987. All the melodies of the above films bear a stamp of the great Mohammed Rafi’s invincible mastery over music and melodies. Naushad used Rafi’s voice for almost all actors of that time including Bharat Bhushan and Dilip Kumar, rajendra Kumar, etc. Mohammed Rafi sahab’s finest melodies sung by him for many of the compositions of music composer: Sachin Dev Burman, in the following movies: Pyaasa (1957), Nau Do Gyarah (1957), Solva Saal (1958), Kalapani (1958), Kaagaz Ke Phool (1959), Insan Jaag Utha (1959), Manzil (1960), Kala Bazar (1960), Bambai Ka Babu (1960), Baat Ek Raat Ki (1962), Tere Ghar Ke Samne (1963), Meri Surat Teri Ankhen (1963), Ziddi (1964), Benazir (1964), Teen Devian (1965), Guide (1965), Jewel Thief (1967), Talash (1969), Aradhana (1969), Ishq Par Zor Nahin (1970), Naya Zamana (1971), Gambler (1971), Abhimaan (1973) and many other memorable movies, have all remained unparalleled in terms of the sheer amount of artistic creativity, artistic dexterity and originality. Mohammed Rafi has sung innumerable exquisite melodies for music composers: Shankar Jaikishan, in the following movies: Barsaat(1949), Boot Polish (1954), Seema(1955), Shri 420(1955), Basant Bahaar(1956), Halaku(1956), Rajhath(1956), Yahudi(1958), Chhoti Bahen(1959), Love Marriage(1959), Shararat(1959), Ek phool Char Kaante(1960), Boy Friend(1961), Jab Pyar Kisise Hota Hai(1961), Junglee(1962), Sasuraal(1961), Asli Naqli(1962), Dil Tera Diwana(1962), Professor(1962), Dil Ek Mandir(1963), Hamraahi(1963), Aai milan ki bela(1964), April fool(1964), Beti Bete(1964), Rajkumar(1964), Sanjh aur Sawera(1965), Sangam(1964), Zindagi(1964), Aarzoo(1965), Gumnaam(1965), Jaanwar(1965), Badtameez(1966), Gaban(1966), Love in Tokyo(1966), Suraj(1966), Aman(1967), An Evening in Paris(1967), Laat Sahab(1967), Raat Aur Din(1967), Brahmchari (1968), Duniya(1968), Jhuk gaya Aasman(1968), Kanyadaan(1968), Mere Huzoor(1968), Sapno ka Saudagar(1968), Prince(1969), Pyar hi Pyar(1969), Tumsa Achha Kaun hai(1969), Yakeen(1969), Dharti(1970), Pagla kahin ka(1970), Andaaz(1971), Jwalaa(1971), Laal Patthar(1971), Seema(1972) and innumerable other movies. Mohammed Rafi has sung innumerable exquisite melodies for music composer: O. P. Nayyar, in the following movies: Aar-Paar (1954), Mr & Mrs 55 (1955), C.I.D. (1956), Chhoo Mantar (1956), Tumsa Nahin Dekha (1957), Naya Daur (1957), Johnny Walker (1957), Sone Ki Chidiya (1958), Raagini (1958), Phagun (1958), Howrah Bridge (1958), 12 O’Clock (1958), Do Ustad (1959), Kalpana (1960), Jaali Note (1960), Ek Musafir Ek Hasina (1962), Phir Wohi Dil Laya Hoon (1963), Kashmir Ki Kali (1964), Mere Sanam (1965), Yeh Raat Phir Na Aayegi (1966), Sawan Ki Ghata (1966), Baharen Phir Bhi Aayengi (1966), Humsaya (1968) and innumerable other movies. Mohammed Rafi has sung many of the finest melodies for music composer: Madan Mohan, in the following movies: Railway Platform (1955), Gateway Of India (1957), Aakhri Dao (1958), Adalat (1958), Jagir (1959), Sharabi (1964), Aap Ki Parchhaiyan (1964) , Haqeeqat (1964) , Jahan Ara (1964), Suhagan (1964), Ghazal (1964), Neela Aakash (1965), Neend Hamari Khwab Tumhare (1966), Mera Saya (1966) , Dulhan Ek Raat Ki (1966), Naunihaal (1967), Chiraag (1969), Dastak (1970), Heer Ranjha (June 19, 1970), Hanste Zakhm (1973), Koshish (1972), Laila Majnu (1976) and many other memorable movies. Mohammed Rafi sang a host of hit songs in the mid seventies. One of Madan Mohan’s last compositions for the film Laila Majnu was released on 1976. He used Mohammed Rafi as the playback singer for new comer Rishi Kapoor. The songs: Tere Dar Pe Aaya Hoon and Barbad-E-Mohabbat Ki Dua were huge hits. The finest melodies that were created by Roshan and sung by Mohammed Rafi with utmost artistic creativity have an ever-lasting place in the hearts of music lovers. Mohammed Rafi has sung many of the finest melodies for music composer: Roshan, in the following movies: Chaandni Chowk(1955), Baabar(1960), Barsaat ki Raat(1960), Aarti(1962), Taj Mahal(1963), Chitralekha(1964), Dhooj Ka Chand(1964), Bedaag (1965), Bheegi Raat(1965), Nai Umar ki Nai Fasal(1965), Daadi Ma(1966), Bahu Begum(1967), Anokhi Raat(1968) and many other movies. Mohammed Rafi has sung many of the finest melodies for music composers (Duo): Husnlal-Bhagatram, in the following movies like: Pyaar Ki Jeet (1948), Bari Bahan (1958), Afsaana(1951), Sanam(1951), Shama Parwaana (1954) and many other movies. Mohammed Rafi has sung many of the finest melodies for music composer: C. Ramchandra, in the following movies: Albela (1951), Sangraam (1951), Naushervan-e-Dil (1957), Amardeep (1958), Paigham and many other movies. Mohammed Rafi has sung many of the finest melodies for music composer: Khaiyyam, in the following movies: Lala Rukh(1958), Phir Subah Hogi(1959), Shola Aur Shabnam(1961), Shagun(1964), Mohabbat Isko Kehte Hain(1965), Aakhiri Khat(1966), Shankar Hussain(1977) and many other movies. Mohammed Rafi has sung many of the finest melodies for music composer: Hansraj Behl, in the following movies: Changez Khan(1957), Miss Bombay(1958), Saawan(1959) and Sikander-E-Azam(1965), etc. Mohammed Rafi has sung many of the finest melodies for music composer: N. Dutta in the movies: Chandrakanta (1956), Mr.X(1957), Saadhna(1958), Black Cat(1958), Dhool Ka Phool(1959), Naya Raasta(1970) and many other movies. Mohammed Rafi has sung many of the finest melodies for music composer: Jaidev, in the movies: Hum Dono(1961), Mujhe Jeene Do(1963) and many other movies. Mohammed Rafi has sung many of the finest melodies for music composer: Chitragupta, in the movies: Bhabhi (1957), Kali Topi Lal Rumal (1959), Opera House (1961), Zabak (1961), Main Chup Rahungi (1962), Oonche Log(1965) and many other movies. Mohammed Rafi has sung many of the finest melodies for music composer: Vasanth Desai in the film: Goonj Uthi Shehnai(1959) and other movies. Mohammed Rafi has sung many of the finest melodies for music composer: Hemant Kumar in the films: Jaagriti (1955), Miss Mary (1957) and many other movies. Mohammed Rafi has sung many of the finest melodies for music composer: S.N.Tripathi in the films: Haatimtai (1956), Janam Janam Ke Phere (1957), Laal Quila (1960), Sangeet Samrat Tansen (1962) and many other movies. Mohammed Rafi has sung many of the finest melodies for music composer: Ghulam Mohammed, in the following movies: Mirza Ghalib(1954), Pakeezah(1971) and many other movies. Mohammed Rafi has sung many of the finest melodies for music composer: Sajjad Hussain, in the following movies: Hulchal (1951), Rustam Sohraab (1963) and many other movies. Mohammed Rafi has sung many of the finest melodies for music composer: Salil Chowdhary, in the following movies: Jagte Raho (1956), Madhumati (1958), Usne Kaha Tha (1960), Maya (1961), Kabuliwala (1961) and many other movies. Mohammed Rafi has sung many of the finest melodies for music composer: S. Mohindar, in the following movies: Paapi(1953), Shirin-Farhad (1957), Mehlon Ke Khwaab (1960) and many other movies. Mohammed Rafi has sung many of the finest melodies for music composers (Duo): Sapan-Jagmohan, in the following movie: Begaana (1963) and other movies. Mohammed Rafi has sung many of the finest melodies for music composer: Ravi, in the following movies: Chaudhvin Ka Chand (1960), Gharana (1961), Tower House (1962), China Town (1962), Bharosa (1963), Gehra Daag (1963), Yeh Raaste Hain Pyar Ke (1963), Ustadon Ke Ustad (1963), Aaj Aur Kal (1963), Door Ki Awaaz (1964), Kajal (1965), Waqt (1965), Khandan (1965), Do Badan (1966), Nai Roshni (1967), Neel Kamal (1968), Aankhen (1968), Ek Phool Do Mali (1969) and many other movies. Mohammed Rafi was composer Ravi’s favorite playback singer. Rafi sahab won his first Filmfare Award for the immortal love song: “Chaudvin Ka Chand Ho” (film:Chaudvin Ka Chand, 1960 ) penned by legendry poet: Shakeel Badayuni. “Sau baar Janam lenge” the legendry melody sung by Mohammed Rafi and composed by Ravi for the film: “Ustadon ke Ustad”(1961) has a unique place in the history of music of Hindi cinema. Rafi sahab sang the famous Rock-n-Roll number: Baar Baar Dekho from the movie: China Town , picturized on Shammi Kapoor. Other songs composed by Ravi and sung by Rafi sahab include: Choo Lene Do (film: Kaajal 1965), Raha Gardishon Mein Hardam and Naseeb Mein Jiske (both from the film Do Badan 1966), Aaja Tujhko Pukare and Babul Ki Duaayen Leti Ja (Neel Kamal, 1968, for which Rafi won the National Award) and Mujhe Ishq Hain Tumhise (Ummeed, 1972). Mohammed Rafi has sung many of the finest melodies for music composers (Duo): Kalyanji-Anandji, in the following movies: Chhaliya (1960), Dil Bhi Tera Hum Bhi Tere(1960), Passport(1961), Bluff Master(1963), Phool Bane Angarey(1963), Ishaara(1964), Himalay Ki God Mein(1965), Jab Jab Phool Khile(1965), Preet Na Jaane Reet(1966), Raaz(1967), Haseena Maan Jayegi(1968), Geet(1970), Gopi(1970), Sachcha Jhoota(1970), Chhoti Bahu(1971), Maryada(1971), Haath Ki Safai(1974), Zanjeer(1974), Bairaag(1976), Kalicharan (1977), Muqaddar Ka Sikandar(1978) and many other movies. The famous composers duo Laxmikant-Pyarelal had great adoration and admiration for Mohammed Rafi sahab. The innumerable movies for which Laxmikant Pyarelal had composed music and Mohammed Rafi had sung melodies are as follows: Parasmani (1963), Dosti (1964), Aaya Toofan (1964), Pyaar Kiye Jaa (1966), Aaye Din Bahar Ke (1966), Taqdeer (1967), Shagird (1967), Night in London (1967), Patthar Ke Sanam (1967), Izzat (1968), Mere Hamdam Mere Dost (1968), Wapas (1969), Sajjan (1969), Do Raaste (1969), Intaquam (1969), Jeene Ki Raah (1969), Jigri Dost (1969), Anjaana (1969), Aya Sawan Jhoom Ke (1969), Sharafat (1970), Aan Milo Sajna (1970), Jeevan Mrityu (1970), Khilona (1970), Humjoli (1970), Mehboob Ki Mehndi (1971), Mera Gaon Mera Desh (1971), Woh Din Yaad Karo (1971), Haathi Mere Saathi (1971), Aap Aye Bahaar Ayee (1971), Gora Aur Kala (1972), Dastaan (1972), Ek Nazar (1972), Loafer (1973), Dost (1974), Majboor (1974), Pratigya (1975), Dharam Veer (1977), Amar Akbar Anthony (1977), Main Tulsi Tere Aangan Ki (1978), Sargam (1979), Jaani Dushman (1979), Suhaag (1979), Ram Balram (1980), Karz (1980), Dostana (1980), Naseeb (1981) and innumerable other movies including the film: Aas Pas(1981) for which Mohammed Rafi had sung his life’s last song: “Tu kahin Aas Pas hai dost”. Mohammed Rafi has sung many superb melodies for music composer: Iqbal Qureshi, in the following movies: Love In Simla (1960), Bindiya (1961), Cha Cha Cha (1964) and other movies. Mohammed Rafi has sung many superb melodies for music composer: Ramlal, in the following movie: Sehra(1963) and other movies. Mohammed Rafi has sung many superb melodies for music composer: R.D.Burman, in the following movies: Chhote Nawab (1961), Teesri Manzil (1966), Baharon Ke Sapne (1967), Abhilasha (1968), Pyar Ka Mausam (1969), The Train (1970), Caravan (1971), Yaadon Ki Baaraat (1973), Hum Kisi Se Kum Nahin (1977), Abdullah (1980), Bulundi (1980), The Burning Train (1980), Shaan (1980), Kudrat (1981) and many other movies. In 1973, Nassir Hussain’s Yaadon Ki Baarat ( Music by R.D.Burman, Lyrics: Majrooh Sultanpuri) got released. The duet sung by Rafi sahab and Asha Bhonsle: Chura Liya Hain Tumne, was a block buster hit. The song is still considered by many as the best duet that the industry ever produced. In 1977, Nasir Hussain released Hum Kisise Kam Nahin. R.D.Burman’s compositions sung by Mohammed Rafi in the movie: Hum Kisise Kam Nahin like: “Kya Hua Tera Wada”, “Chand Mera Dil”, “Hum Kisise Kam Nahin” and “Yeh ladka” (duet with Asha). All these songs were huge hits and chart busters. Mohammed Rafi won his sixth Filfare Award for the song: Kya Hua Tera Wada. He also won the National Award for the same song, his second National Award. Mohammed Rafi has sung many superb melodies for music composer: Usha Khanna, in the following movies: Dil Deke Dekho (1959), Shabnam (1964), Nishan (1965), Ek Sapera Ek Lutera (1965), Hawas (1974), Aap To Aise Na The (1980) and many other movies. Mohammed Rafi has sung many superb melodies for music composer: Rajesh Roshan, in the following movies: Kaala Patthar(1979), Mr. Natwarlaal(1979) and many other movies. Mohammed Rafi has sung many superb melodies for music composer: Ravindra Jain, in the following movies: Kaanch Aur Heera(1972), Chor Machaye Shor(1974), Fakeera (1976) and many other movies. In 1965, Mohammed Rafi was honoured by the Government of India with the Padma Sri Award. Rafi concentrated on live music shows in the 1970s, which were huge hits. He performed in many places, in and outside India. He pioneered a trend which is still very prevalent amongst Bollywood actors and singers. Mohammed Rafi has the distinction of being the first playback singer of all times to be featured in the pioneering list of the Guinness Book of World Records, for having sung the highest number of songs, which is a total of 26000 songs, in Hindi and other languages. Mohammed Rafi sahab passed away on 31 July 1980 at 10.50 P.M.
Mohammed Rafi was like an angel. He was very soft spoken, seldom angry, very humble. He was very pious person. Rafi sahab’s wife’s name was Bilquis and they had three sons and four daughters. He believed in the concept of simple living and high thinking. Mohammed Rafi was a genius and at the same time very humble. During his lifetime Mohammed Rafi had donated immeasurable money in charity, noble causes and for our country. He was a true patriot of India and he believed in our country’s secular values and our rich culture, tradition and heritage. The boundaries of religion, caste, creed, richness, poverty, economic class, language and politics were beyond the legendry stature of Mohammed Rafi and he was above all these boundaries. Numerous instances are there when he bought expensive imported Dialysis equipment to our country to assist charity hospitals that serve ailing kidney patients of our nation. Rafi sahab was an ideal man with loft ideals and esteemed values for which he was ready to face anything. This was the same reason that he declared that he will not take royalty for any of the songs that he had sung. A view-point that resulted in a grave clash of principles with another legend Lata Mangeshkar, who had a major debate over the issue of royalties in 1960. Rafi believed that once a recording was over and a singer has been paid, he or she should not ask for more. Lata, on the other hand said that singers should be paid royalties for their works, over and above the amount given for the singing. For, three years Mohammed Rafi and Lata Mangeshker did not sing duets or speak with each other. It was the most dignified silence over clash of principles. They refused to sing songs together. At the insistence of Nargis they finally made up at a stage concert and sang Dil Pukare from the film Jewel thief, composed by S D Burman. Many new music directors would come to Rafi sahab and request him that if he sang for their compositions then they would get chance in films. Mohammed Rafi sahab would not only sang for them but also when the producer used to pay renumeration for the songs, Rafi sahib would gift it to these new music directors. That was the encouragement that Rafi sahab had for new talent. He would recommend names of his contemporary singers without an iota of jealousy. Thus, making Rafi sahab the most loved respected and cherished human being of all time. Mohammed Rafi was the supreme melody king of Hindi cinema and at the same time he was a man with a golden heart and a resplendent smile that glowed from his radiant face. Till the day he lived, he ruled like a king and after passing away also Mohammed Rafi continues to reign the music world. May God bless him. The above facts about Mohammed Rafi’s life are original and has been contributed by V. Venkat Rajan. Thank u dear Mohan Floraji for ur kind message. For all Rafians the only mission left now as a hobby or passion to compile max collections of cds, vcds which our Guruji n Emperor of music has left behind. These are invaluable treasures for all music lovers to listen enjoy and traverse to the world of evergreen hits from our maestro Rafi Sahab. Infact in Blore we are organising a musical evening on 14th as a tribute to Naushad sahab by Sangeeth katti kulkarni a renowned disciple of Naushad sahab and NRI from U.S.A Sanjeev Ramabhadran who is a big fan n devotee of Rafi Sahab and who has won the TVS SAREGAMA progam of NRI round. Thanks for the updates on the different functions held in rememberance of the great Rafisaab. Nice to know he is still in the minds of millions! take a bow for such a grt article u have written wht every rafian wud have wanted to write u have represented all of us in just one post of urs, long live the king n his kingdom is unsurpassed by anyone!! he was the most perfect singer n for me the greatest voice to have gone behind the mike!! nobody cud quite express the way he cud,his voice was/is like honey smooth n sweet,unmatched n indomitable,unadulterated n divine;sry running out of words to spk abt his grtness!!!! i am a big rafi fan but at the same time i wud not want to degrade other singers especially kk who has done a lot for the music industry.im not saying tht he was a s good as rafisaab nobody ever cud be but even rafisaab wud not want u to degrade other singers for such a humble soul this wud be a deplorable act!! Very happy to share with all music lovers particularly Rafians that on 24th Dec and 25th Dec various programs were held in Mumbai and other parts . I was also fortunate to attend the funtions held in honour of our idol in Padmashree Rafi Chowk in the most visible juncttion near Bandra station. Also the famous Keep Alive created by Manohar iyer held mind bogling musical program in memory of Rafi sahab held at a jampacked audience in Shanmukhananda hall. We were literally treated to the romantic melodies of Rafi sahab form 40s to late 60s under excellent orchestra and Srikant who was at his best belting out all popular Rafi sahabs number. Learnt that such events were highly successful in other parts which still proves that good music cannot die and Rafi Sahab is ever immortal and eternal. as u said that ”no singer is perfect” i agree with u but when listen 2 Mohd Rafi i don’t agree with u because when we speak about bollywood music it start in 1950’s,was young in 1960’s was old 1970’s and no music after 1980. (it mean that only Mohd rafi is perfect).Dear Irony80 as i think one can have 100% mark in exam it is same 2 Mohd Rafi he has got 100% mark in singing. HERE IS THE REAL INCIDENT WHICH TOOK AFTER THE ”ARADHANA” FILM RELEASE.AS WE ALL MUSIC LOVERS KNOW HOW WAS THE BIG HIT SPECIALLY SONG OF ”MERE SAPNOKI RAANI KAB CHALI……..”IT WAS MASSIVE HIT AND KISHORDA WAS ULTIMATELY OVERNIGHT STAR……………..SO DURING THOSE PERIOD AT ONE STAGE SHOW…….DURING AUTOGRAPH SESSION ONE OF THE AUDIENCE WHO CAME TO TAKE AUTOGRAPH OF KISHORE HAD PRAISED…..” KISHOREDA AAPNE THO RAFISAAB KA CHUTTI KARDI………” BEFORE HE COMPLETES FURTHER SENTENCE………..THE GREAT KISHOREDA LITERALLY SLAPPED ON HIS FACE AND TOLD” RAFI SAAB KO MAIN THO KYA……DUS KISHORE KUMAR MILKE BHI CHUTTI NAHI KARSAKTHA”……….. THIS WAS THE RESPECT KISHOREDA HAVING TOWARDS THE RAFI SAAB………..SO DEAR KISHOREDA FANS DO NOT FIGHT OR ARGUE I THINK THIS ONE EXAMPLE IS ENOUGH. REGARDING MOHD.RAFI………..I THINK HE WAS A SAINT IN THE MODERN TIMES…..I HAVE NOT HEARD OR READ A SINGLE NEGATIVE COMMENT OR INCIDENT FROM ANYONE EVEN FROM HIS SAMEAGE SINGERS LIKE ”MANNADE, MUKESH, KISHOREDA, TALAT AZIZ, MAHENDRA KAPOOR,NITIN OR EVEN AMITKUMAR…… SUCH WAS THE PERSON……….IAM SORRY TO SAY CAN YOU HEARD REGARDING KISHOREDA……NO NEVER!…..HE WAS MONEY MINDED…SELFISH.ANYWAY THAT WAS NOT THE TOPIC I WANT TO TELL…………..HIS SIMPLICITY WAS SUCH AN EXTENT THAT EVEN BIG B[AMITABH] IN ONE OF INTERVIEW TOLD THAT RAFISAAB WAS SO HUMBLE AND RESPECTS THE PERSON NO MATTER THE PERSON IS WHETHER PRODUCER,MUSIC DIR, ACTOR OR EVEN A GATE KEEPER……………AMITABH FURTHER ADDS THAT ” WHEN RAFISAAB COMES TO MUSIC STUDIO GATE BEFORE THE GATE KEEPERS SALUTE TO RAFISAAB……….RAFI SAABS HANDS WERE ALREADY RAISED TO SALUTE THE GATEKEEPER………” SUCH WAS THE RESPECT TOWARDS THE PEOPLE AND COLLEAGUES………. IF I GO ON TELLING THE INCIDENT I CAN COMPLETE A BOOK ON MOHD.RAFI……….IAM PROUD OF HIM EVENTHOUH IAM AN HINDU…….IAM GREATEST FAN OF THE RAFI SAAB….AND I AM VERY LUCKY THAT RAFI SAAB WAS NOT MIGRATED TO PAKISTAN….DURING THE PARTITION….. I agree with u that we should not use other singer names on this site and offourse no way 2 compare Mohd Rafi with any singer. Do not use other singer names on this Site…. I love Rafi Saheb so much, that I can not see Other names here….you knou what I mean.? Rafi Saheb is Great, and God blessed him with that wonderfull voice….I would say..with that Miraculous Voice…. Please do not compare him with anybody… he is unique…. no singer is perfect. every singer has certain limitations. some are expert in ghazals only, some can sing only classical and so on. as i said, no onw is made perfect, so rafi saab was not perfect either. but he is probably the only singer in this subcontinent if not in the whole world, who is the closest to perfection. he could sing all types, you name it! even lata (declared as india’s no. 1 singer ever) can’t sing all types. i truley believe only rafi saab deserve the praise that lata is getting. lata is no way near to rafi. recently some 30 singers and musicians voted rafi and lata the greatest singers ever and maan re tu kahe from chitralekha sung by rafi the best song ever in indian history. but they forget dekhi zamaneki yaari, the most touchable song, o duniya ke rakhwale, the most difficult song, chahunga mai tujhe, app ke pehlu, teri ankho ke, mere mehboob, tumhari zulf ke, pookarta chala hu,,,an so so on. if you make top 50 or 100, 95% or more songs will be those sung by rafi. S. Hardeep Singh, a die-hard Mohd. Rafi fan and a regular reader of Screen shared with us some interesting information. According to Singh, Rafi, a legend, has no equal, and he has the distinction of singing for almost all the male stars. Singh adds that Rafi has sung with almost all the playback singers in India, and then furnishes us with the names of the singers with whom Rafi sang. He cautions that the list may not be a complete one, but nevertheless is close to being accurate. I partially agree with Unknow 1. We should not put undue pressure upon the Indian Government to confer Bharat Ratna to Mohd. Rafi Sahib. Bharat Ratna is nothing before Rafi Sahib’s contribution to Indian Light Music. But Unknow 1, Actually who are you? Why do you hide your identity? If you are so bold and give such daring comments and suggestions to our society ….. Come before and tell your real identity. Tell me, Why the Rafi Sahib’s fans should not put pressure upon the Indian Govt? After all they have their own feelings and emotions for their beloved Rafi. The Rafi fans could not be stopped. It is their due right to do so. It is a great news for us that serious type of Rafi fans have come together. They must reach to their desired targets. Let’s hope for the desired targets. Mohd. Rafi Music Academy will be a reality soon. One day there will also be a Mohd. Rafi Music University, The Daily Mohd. Rafi Times, Mohd. Rafi Channel, Mohd. Rafi News Channel, Mohd. Rafi City, Mohd. Rafi Township etc. etc. Let’s see, who will initiate towards this direction? We ‘ll hope positively that all these our dreams would surely be a reality with the efforts of Mr. Binu Nair, Mr. Anmol Singh, Er. Mohan Flora, Mr. P. Narayannan, Mr. Ashish Kapoor (New Delhi), Mr. Parvez (Kochin-Kerala), all the Mohd. Rafi Fans’ Clubs, Mohd. Rafi Memorial Societies and all the respected fans of Rafi Sahib. That is great news! The Dalit Conference of Delhi putting pressure on the Govt. There is need for more such political pressure. Yes its a great teamwork happening with all the Rafians during the birth anniversary celebrations of our icon and idol Janab Rafi Sahab. I could meet some of them in Delhi, Mumbai and Ahmedabad and was very happy to see the passion and intimacy amongst Rafians. On 25th we saw the famous Keep Alive of Manohar Iyer who with excellent presentation, music orchestrisation and Srikant narayan as a singer who sang some of the great hits of Rafi sahab with good measure. The program in ShanmukhanandaHall was jampacked and the music lovers were claumouring for more. With 6.30pm to 10.30pm there was only 7 minute break which speaks volume of the dedication of Keep Alive group. In Ahmedabad met Umesh Makhija who has converted his one bed room into RAFI MUSEUM with all the collection of more than 140 photos of our idol, newspaper n magazines articles and decorating the bed with the hit songs of Rafi Sahab per year for 35years. Now today I came to know the Dalit conference of Delhi is going to the govt to put pressure on them to confer Bharat Ratna on the one only Rafi Sahab. 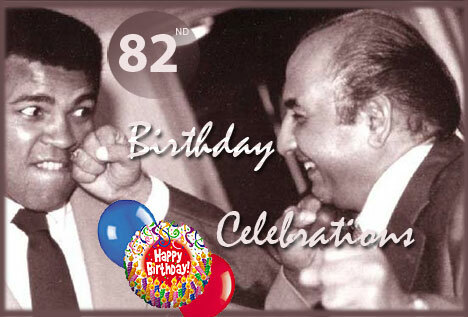 Perhaps a great photograph indeed, to see Rafi Saab along with Mohd Ali one the greatest boxers of all times. The clash of two legends , the clash of two Capricorns. Also the King of Rock music Elves Prestly is also a Capricorn and so is another great singer John Danver. John Danver is best recognised for his English score “Annie’s Song”. So in other words the field of music is dominated by Capricorns. Rafi is the only singer who could sing with ease all types of songs involving classical numbers, romantic songs, sad songs, bhajans, ghazals, qawwaliâ€™s. And his voice could match all the heroes of 1950â€™s and 1960,s and also 1970â€™s. No other singer could match this versatility of singing of all types of songs. Some singers excelled in classical, some in sad and romantic numbers, some in ghazals and some in bhajans and some only for particular type of heroes etc. So fact that Rafi could sing all types of songs speaks for his Great versatility. Scores of articles have been written on Rafi. One does not have to read so many articles on Rafi to realize his Greatness. When one listens to Rafiâ€™s variety of songs, they will speak volumes about his Great singing ability. In 1965, Indian Government awarded Rafi the prestigious National award Padmashri. In 1977, Rafi was awarded Rajat Kamal award by the then President Shri Sanjiva Reddy at the 25th National Film Festival Awards ceremony held in Delhi. In spite of being number one singer, Rafi was a very humble, soft-spoken and unostentatious person. Rafi had a tremendous integrity and at times helped struggling music directors while singing for them without charging them any fees. Today there is no substitute for Rafi. Rafiâ€™s voice truly reflected his own character. The purity of his voice reflected his own noble character. The purity of his voice reflected his own ideals and mind. Rafi was very unassuming. His greatness lies with the fact that he never had any ego. Rafi was never affected by material values. Material values never affected Rafiâ€™s social ethics. Rafiâ€™s voice reflected spirituality. Rafi maintained unblemished illustrious career and scaled heights of fame and popularity no other singer ever achieved. Rafi retained untarnished and unblemished image in the Bollywoodâ€™s film industry otherwise known for vices than good it produces. Rafi had absolutely no vices whatsoever. In one of the interviews, Rafi revealed that he held all the Religions in high esteem. Rafi was a very charitable person. He donated part of his money to different charities. He had very good public relations with all the music directors, movie directors and producers. Rafi was very popular as a good human being among all the people working in Bollywood. Rafi was also a very pious person. Rafi never cared about getting royalty for the songs he sung. He only charged money upfront for each song and that was it. In early 1960â€™s, Rafi had a difference of opinion with Lata Mangeshkar who insisted upon getting the royalty in addition to the payment for each song. Rafi did not agree with Lata and because of these differences Rafi and Lata did not sing together for few years during 1960â€™s. TEARS OF JOY ROLLED FROM MY EYES AS YOU HAVE ECHOED THE PASSIONATE SENTIMENTS OF ORDINARY MORTALS BUT CRAZIEST FANS OF OUR BELOVED EMPEROR OF MUSIC RAFI SAHAB. YES I SUPPORT MOHAN FLORAS VIEWS WE WANT MORE POEMS AND ARTICLES FROM VERY KNOWLEDGABLE PERSON LIKE YOU. DEAR HARMINDERJI YES YOU ARE RIGHT WHEN RAFI SAHAB PASSED AWAY THE CROWDS OF DEVOTEES INSPITE OF THE TORRID BOMBAY RAINS WERE UNMANAGEABLE AND THE POLICE HAD TO USE LATHI CHARGE NEAR SANTACRUZ POLICE STATION NEAR THE CEMETRY. THE LIVE RECORDINGS IN ORIGINAL ARE AVAILABLE WITH THE PRODUCER ABU WHO IS 72 YEAR OLD RAFI SAHABS FAN WHO WANTS TO RELEASE THESE FILMS BY GIVING THE MARKETING RIGHTS TO PROFESSIONALS WHO CAN PROPERLY DO JUSTICE. Thanks for these videos, some of them are woderful. Can anyone provide live recodings, interviews and above all pictures of his last journey. I am told that Bombay witnessed some of the heaviest rain that day, yet mourners came out showing respect for him. Life came to a standstill. Long live Rafi Sahib. There are not few singersâ€™ in this world who could hold sway over peopleâ€™s hearts and souls, defying Time and Age but there is only one singer called Mohd Rafi. BEST WISHES TO ALL RAFI FANS ON HIS BIRTH ANNIVERSARY! Great writings and feelings again! I feel that you are the greatest fan Rafisaab will ever have! Your articles on this site are sparse even though you have the vast collection of views and analysis of the Masters work! I hope you will share more of your views and give inputs to this site. Your way of expressing the feelings and emotions of a Rafi fan are unique. “Life Without Rafi” is another fact of life some of us Rafi fans have had to live with but his songs keep us going forever! jab jab bhi chand nikla aur tare jagmagaaye mujhe tum yaad aaye. jab jab mere taraane duniyane gungunaaye mujhe tum yaad aaye.